Awaken with JP is best described as a web-based program for personal development. This is a very different type of program from the ones we usually rate and review. Led by JP Sears – a trained holistic coach and well-known internet comedian – this program harnesses the digital medium to offer users access to his pathway to personal growth. He incorporates humor and a unique, non-traditional point of view in his videos, encouraging users to follow his lead. 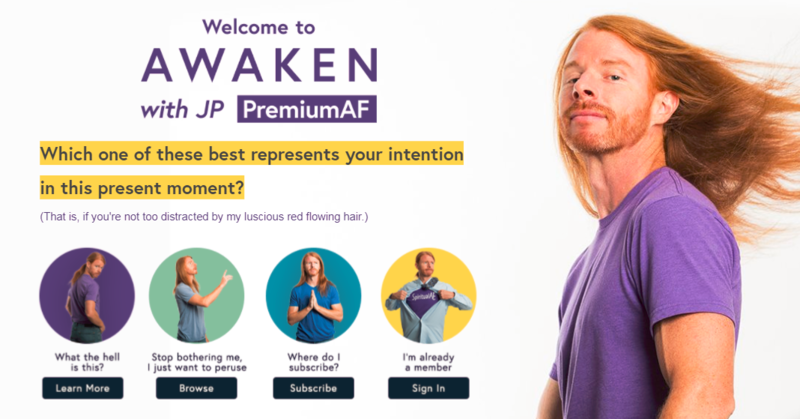 To enter the program, users are required to join the paid Premium web program along with the “Awaken with JP” Facebook group (available only to Premium subscribers). JP releases a video episode every few days, available through the website. In the videos, JP presents lessons focused on a specific theme (e.g. How to take yourself less seriously). Lessons include assignments to be conducted by the users, who are encouraged to film themselves and post to the Facebook group. At the time of review, the community was active and cooperated with the assignments. Inconvenient split between different digital platforms. Awaken with JP offers a new and innovative approach as a digital intervention that makes good use of the social media platform to create a sense of online community and to encourage people to interact with each other in a beneficial way. The social community platform delivered via Facebook facilitates the development of reciprocal relationships between community members who, without the shield of anonymity, share their completed tasks, and view and comment on other members’ shared tasks. This seems to be highly engaging and empowering. The program’s current target audience is people who are familiar with JP through his previous (mostly comic) online activities and who seek support for achieving personal growth. Therefore, it is recommended that new users who are not acquainted with JP’s personal style and humor familiarize themselves with some of his videos in order to see if it is a good fit. The combination of lessons with community-based assignments motivates users to participate in a way that resembles group therapy more than online chat groups or most Facebook groups. On the downside, the split between two different digital platforms is somewhat inconvenient. Awaken with JP could be recommended as part of ongoing treatment for patients who are seeking personal development and who would value the unconventional spirit of the program. Assignments could be discussed during therapy sessions to create continuity between the program and therapy.